2014 is here and with every new year, comes new resolutions. If you're like me, then making your list of new year's resolutions involves stowing the list away and making a promise to actually complete it. Then a month or two into the new year, you eventually forget your so called vow. Over the years I've made plenty of resolutions that I hoped to fulfill, only to find my list a week before New Year's day. It wasn't until my mom gave me the idea to create a visualization board, that I finally began to see some results. If you have ever read the book The Secret or have heard about the Law of Attraction, then you definitely know what a Visualization/Action/Dream Board is all about. For those of you who don't know it's exactly what the name implies, a board filled with pictures to help you visualize success. After all, Alan Kay did say, "The best way to predict the future is to invent it." So, start this year off right by making a visualization board. It's a great tool to stay positive and motivated throughout the year. If you hang it somewhere where you can see it everyday, like your bedroom, it's a great visual refresher. However, making a board or just writing a list of resolutions isn't enough. In order to achieve a goal, you've got to want it, believe in it and go out and work for it too! 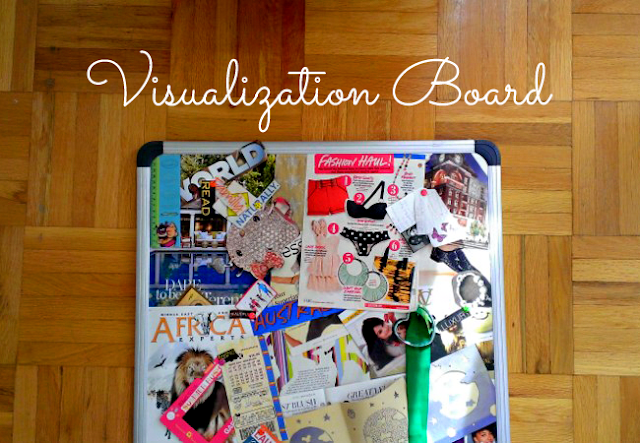 So here are my tips on how to make the perfect Visualization Board. Step 1: Find yourself a wide variety of magazines. They don't have to be the latest issues, but make sure that they have some interesting pictures that you like. Step 2: Get yourself a corkboard and some pushpins. 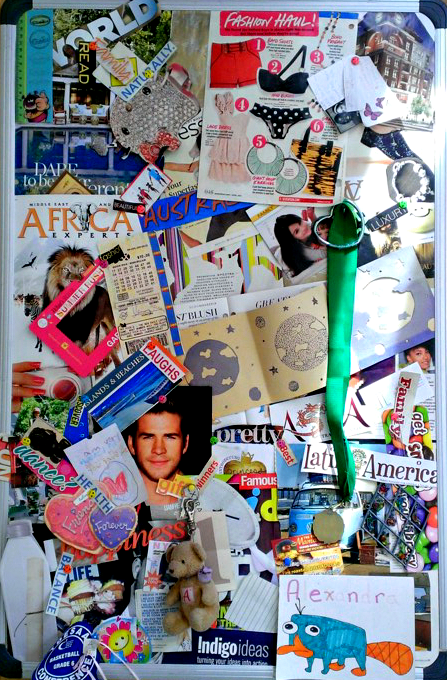 Step 3: Cut out some pictures of inspirational people, aspirational activities, objects you desire, travel destinations, etc. Basically, pick and snip anything that makes you happy. You can also use old pictures, postcards or Polaroid pictures as well. Just add anything to personalise it to your taste and to the theme that you are trying to create. Step 4: Write and/or cut out some words that you like. These will help to embellish your board, and serve as mini sparks of motivation. Step 5: Make sure to use the larger pictures first. This way you can cover up the entire board. Another option is to either lay some funky wrapping paper or fabric over the board beforehand. Step 6: Add and arrange your clippings in any way that pleases you, and hang it up for all to see! I've heard of this before. A girl at work had one of these at her desk and swears by it! It really is a great tool to keep you on track towards sertting your resolutions or random goals.Also, I love how it's really fun to make! Yay! I'm happy that you enjoyed the article and even more glad that you are going to creat a board too! They really are pretty fun to make, and they've worked for me so far.